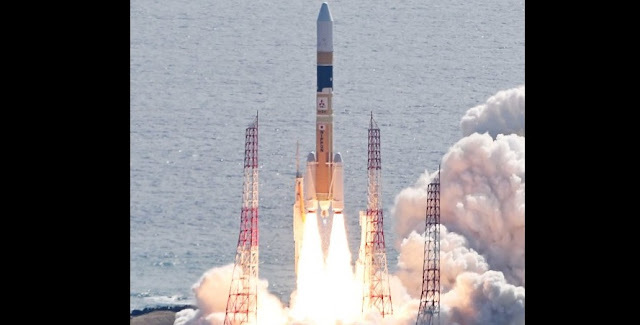 After a 24-hour delay, the Japan Aerospace Exploration Agency (JAXA) successfully launched its H-IIA rocket with the Information Gathering Satellite (IGS) Radar 5 reconnaissance spacecraft. The vehicle soared out of the Tanegashima Space Center at 9:20 p.m. EDT March 16 (01:20 GMT March 17), 2017. The weather prompted mission managers to postpone the flight by a day as it was expected to deteriorate in advance of the original launch date. For the March 17 attempt, the weather cooperated. The 174-foot (53-meter) tall H-IIA rocket, built by Mitsubishi Heavy Industries, was in a 202 configuration, meaning it had two stages, zero liquid-fueled boosters, and two solid-fueled boosters. The first stage’s main engine, the liquid hydrogen and liquid oxygen consuming LE-7A, roared to life as the engine’s turbopumps built up to the 200,000 pounds (870 kilonewtons) of thrust. Once the onboard flight computer deemed the engine start was nominal, the two strap-on boosters, each producing 520,000 lbf (2,305 kN) of thrust, ignited and the vehicle leapt off Pad 1. As it soared into partly cloudy skies, the vehicle began to turn toward its designated orbit. IGS Radar 5 is expected to be placed into a polar orbit around 300 miles (500 kilometers) above Earth. After about two minutes, the two solid motors, no longer needed, separated from the accelerating first stage. Using the lone LE-7A engine, the vehicle continued to push toward space. Once the atmosphere thinned, the payload fairing was jettisoned. This occurred roughly 3.5 minutes after liftoff. Six-and-a-half minutes after leaving southern Japan, the first stage finished consuming its fuel and separated. The second stage’s LE-5B engine soon ignited. It also consumed liquid hydrogen and oxygen. Providing some 31,000 lbf (137 kN) of thrust, the stage finished the job of sending the spacecraft into orbit. IGS Radar 5 joins seven other IGS spacecraft in space. According to the BBC, the IGS program is a Japanese spy satellite program started in response to a 1998 North Korean missile test over Japan. The fleet is operated by the Cabinet Satellite Intelligence Center. It is responsible for a number of state and military intelligence organizations. This was the second launch of 2017 for an H-IIA rocket and the 33rd flight since the vehicle debuted in 2001.